The Port Huron Downtown Development Authority’s 2015-16 budget includes more money to improve infrastructure and cuts money for MainStreet. The authority met Tuesday to discuss the budget, including cutting $30,000 in funding to MainStreet Port Huron — a nonprofit organization created to support the downtown area through special events and promotions. 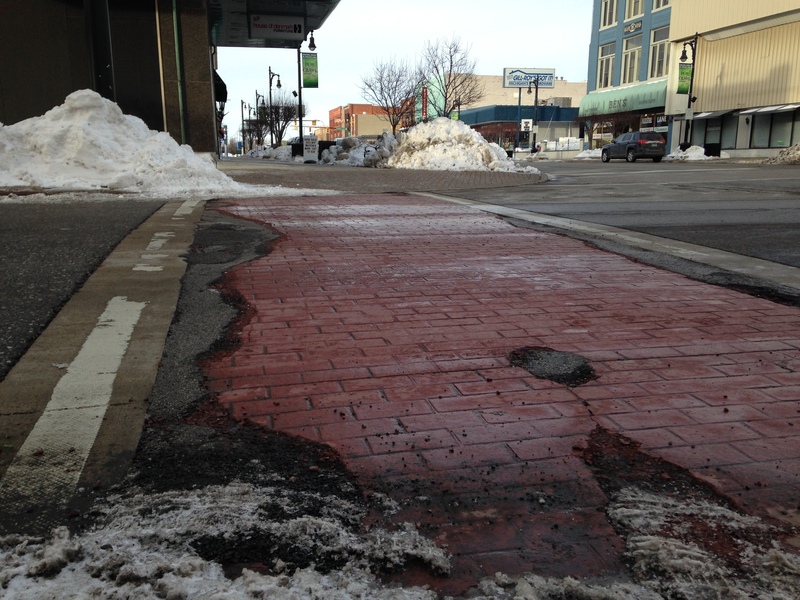 Port Huron City Manager James Freed presented the proposed budget that includes $100,000 toward repairing downtown streetscapes, crosswalks and other infrastructure improvements. The DDA operates on a budget of $194,500. The 2015-16 budget is estimated to be $148,817. Kristi Hazard, MainStreet Port Huron program manager, said she has had conversations with the city, and the DDA cut did not come as a surprise. Hazard said the nonprofit is looking for other funding sources such donations and fundraising. MainStreet Port Huron has coordinated some of the city’s special events, including Blue Water Fest, Art Hop, Chilly Fest and the Lighted Santa Parade. It was formed two years ago with a volunteer staff and one paid position. Hazard said MainStreet Port Huron’s budget is about $104,000, but its board will be approving a new one in March. Freed said if the DDA can’t take care of the downtown’s infrastructure needs, then the agency should not be funding a program like MainStreet. Freed said he believes downtown events will survive without DDA funding, but the entrepreneurs who open businesses in downtown will suffer if the infrastructure continues to deteriorate. The authority also discussed a three-year capital improvement plan to focus on projects such as repairing the East Quay Street parking lot. The DDA’s main purpose is to provide public assets such as the enhanced streetscape, brick pavers and old-fashioned streetlights, and large, lighted parking lots that support businesses, Freed said. The remainder of the 2015-16 budget will go toward the DDA’s office expenses, the facade grant program and making repayments to the city’s land purchase fund. Ed Brennan, director of finance for Port Huron, said the DDA receives its funding from $69,500 worth of taxes. At the end of the current fiscal year there will be $195,000 left over in DDA savings. Freed said he was not completely ruling out spending money to promote events. Past recipients, however, have been warned that they likely would not receive funding from the DDA next year. DDA member Tom Barrett said in the past the authority has gone back and forth with what the funds are used for depending on the need at the time. He said the DDA should at least address the most visible infrastructure areas. “We have varied this, and I’m in support of using it now for improving the infrastructure, but when things get better, I think it should go back toward promoting the city,” Barrett said. DDA member Rich Engle said if MainStreet’s funding was cut, the city might begin to lose the energy the downtown has built up. Tuesday’s draft budget session was preliminary work, Freed said. The DDA will take a more formal action in the next few meetings. DDA members Casey Harris and John Kuithe were not present. The budget discussion complemented a roundtable meeting held in January where downtown business owners voiced what they thought needed to be done. Projects discussed included repairs to downtown streetscapes and crosswalks, addressing parking issues at the East Quay parking lot and updating street lighting. The DDA meeting for Feb. 17 was canceled, and the next meeting is at 8:30 a.m. April 21 in Conference Room 408 at the Municipal Office Center, 100 McMorran Blvd. Contact Tony Wittkowski at (810) 989-6270 or twittkowsk@gannett.com. Follow him on Twitter @tonywittkowski. 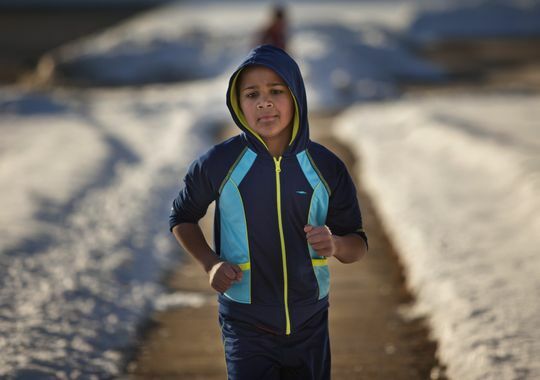 For 20 minutes every Thursday, Dawn Schweihofer runs with two dozen Cleveland Elementary students as part of an after-school running club. As a fifth grade science and social studies teacher, Schweihofer makes sure these students run one mile, read one book and do one good deed once a week. However, the real difference came when Schweihofer took part in the Jingle Bell Run on Dec. 6, 2014, in Port Huron with Amy Meeker-Taylor and Christine Shigley. Schweihofer noticed two of her students were running in jeans because their families couldn’t buy buy jogging clothes. The three have created the Starting Line Youth Running Fund to help children who want to run but cannot afford shoes, apparel or entry fees for local races. The fund’s main focus will be to work with elementary running clubs and their advisers, Shigley said. Most of the donations will help pay entry fees for local races. Schweihofer said most races require $20 to $25 to register a runner. Schweihofer said the fund eventually will offer scholarships to pay for half of the students’ entry fees. The fund was created Jan. 6, with the funds handled by the Community Foundation of St. Clair County. Lynn Alexander, community foundation vice president, said the three organizers came to the organization in early December. When the founders discovered how much paperwork and money went into creating their own charity, they realized they could do the same thing by creating a fund with the community foundation. The two parties established a fund agreement that spelled out what the donations would be used for and allowed the foundation to process a grant on behalf of the running fund organizers. Shigley said organizers have two events planned to help raise money for the fund. On Feb. 12, Fuel Woodfire Grill at 213 Huron Ave., Port Huron,will have a dinner night with 10 percent of sales donated back to the fund. The other is a “Girl’s Night Out” wine tasting event at Green Barn Winery in Smiths Creek from 6-8 p.m. Feb. 28. Money that comes in from the pre-ordered $40 tickets also will go back into the fund. The fund had raised $2,080 as of Tuesday, Shigley said. People can donate online at startinglineyouthrunningfund.weebly.com or through the community foundation. Schweihofer said she and her colleagues are trying not to bite off more than they can chew in the early stages. The fund’s first effort will take place in conjunction with Marysville High School’s Pi Day 5K on March 14 — a 1.57-mile run coordinated by Shigley. Running club students who participate in the fun run won’t pay their entry fee and will be sponsored by donations collected by the running fund. The running club at Cleveland Elementary will be one of the first to benefit from the fund. Cleveland has the only Port Huron-based running club that begins running in January, Schweihofer said. 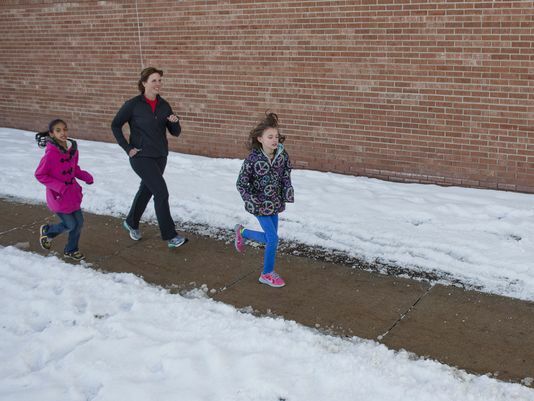 With snow on the ground, students ran four laps around the school’s perimeter to accumulate their weekly mile. Dollars are still being counted, but the Salvation Army of St. Clair County expects to meet its holiday campaign goal. Major Mark Turner said the tally is up to about $385,000, but once all online, mail and business counter kettle donations are added up, the $400,000 goal should be met. Matt Pickett, youth and young adult ministry coordinator, said bell ringers raised more than a third – or nearly $144,000 – of the total earnings. There were 17 locations, and Pickett said bell ringers at Neiman’s Family Market in St. Clair raised the most. 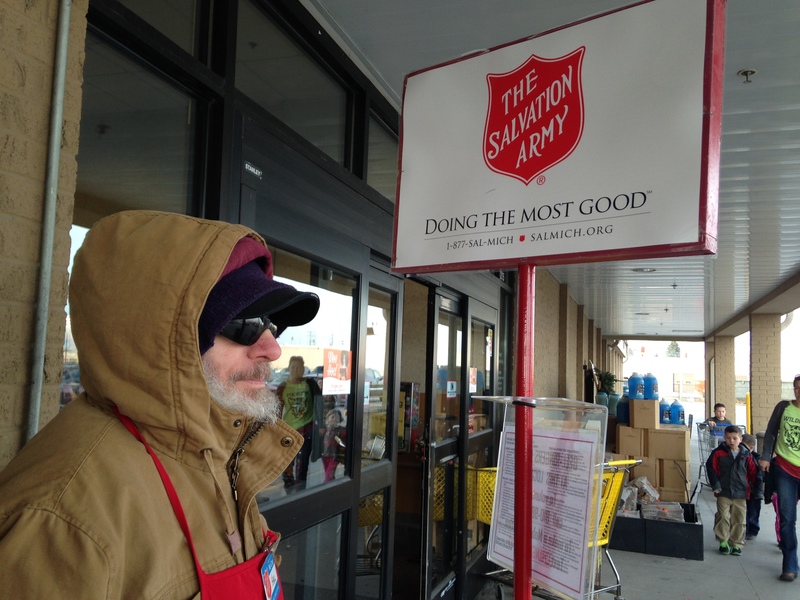 Bell ringers at Walmart in Fort Gratiot were second, followed by bellringers at the Sam’s Club and Kroger in Port Huron Township. Laura Smith, coordinator of the Salvation Army’s Red Kettle campaign, said officials felt they were within reach of their goal, having lowered it from the year before. “Last year the goal was $430,000, but we did not make our goal, so we tried to budget what we thought we could raise,” Smith said. Pickett said the Salvation Army raised $366,980.18 in 2013, with $119,969.97 coming from the Red Kettle campaign. The money raised is used to support local families that come to the Salvation Army for assistance. Support includes money for monthly utilities, rent and food. The food is walk-in only, but the others are by appointment, Smith said. The goal the Salvation Army sets changes each year based on what the organizers believe can be raised, Smith said. In 2012, Smith said the Salvation Army surpassed its goal and decided to increase it in 2013. Smith said Salvation Army organizers set the goal after running through the numbers from the previous year’s campaign. The Red Kettle campaign for 2015 will begin in early November. This year’s Red Kettle campaign ended Dec. 25, which completed a two-month effort that began Nov. 7. Smith said some countertop kettles at local restaurants have yet to be counted. People who want to donate can stop by the Salvation Army Citadel, 2000 Court St., Port Huron, from 8:30 a.m. to 4:30 p.m., Monday through Friday year-round. Donations range from money to clothing and food. MARYSVILLE – Webb Coates stood outside holding a stack of newspapers for two hours by the drive-through of a Tim Horton’s on Friday with a smile and a warm greeting. Coates, a Marysville resident and member of the Knights of Columbus, is one of more than 75 volunteers helping in the two-day effort by the Old Newsboys of Port Huron to raise money for children who need socks, gloves and underwear. The campaign continues Saturday. While the Old Newsboys raise money year-round, they are the most visible on the first Friday and Saturday in December. Standing off to the side where customers would wait to pick up their morning coffee in Marysville, Coates continued to smile and wave a paper in their general direction. Whether they rolled down their windows or not, drivers were treated with a “hello” from Coates, who wore a Santa Claus hat and held a milk carton stuffed with money. Within his first two hours in the cold, Coates said he had received donations from a few hundred coffee junkies. With other volunteers stationed at the various local businesses, the Old Newsboys asked for donations in exchange for a copy of a special edition Times Herald. For this year’s effort, Port Huron Old Newsboys president Ed Weichsler said the group hoped to raise $72,500, which would go toward families who applied for vouchers from the Department of Human Services. The organization gave out 1,316 vouchers this year. Down the street from Coates at the Four Star Grille was Mel Konik — another member of the Knights of Columbus who was taking his turn as an Old Newsboy. Having done so for more than 10 years, Konik was stationed at the popular restaurant and offered his season greetings to those passing by. The number of people who chip in year in and year out has never surprised Konik, who said the area flourishes with generosity around the holidays. Algonac resident Norm Scaglione was out for breakfast when he saw Konik standing near the doorway with a paper in hand. Contact Tony Wittkowski at (810) 956-8905 or twittkowsk@gannett.com. Follow him on Twitter @tonywittkowski. For the past five years, the Port Huron Northern hockey team has been taking part in the Kiwanis Polar Bear Plunge at Lakeside Beach. 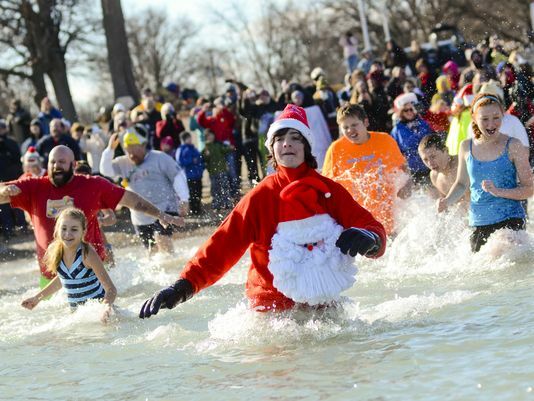 In this year’s plunge, which will be at noon Saturday at Lakeside Beach, spectators can expect to see the team running into the nearly freezing waters of Lake Huron, head coach Daryel McCarrel said. Michelle Shepley, chairwoman of the event, said the plunge was created to raise money for the Port Huron Kiwanis Club. The service club is centered in St. Clair County and has been around for 90 years. Shepley said it has done a lot for youth groups in the area. Those other organizations include Help and Hope, Port Huron Karate and Marysville Middle School, which will be plunging for the March of Dimes. The first year the Kiwanis Club had the Polar Bear Plunge, there were fewer than 50 attendees. In 2013, its 13th year, officials estimated more than 200 people made the plunge. Shepley said as of Tuesday he’s distributed more than 400 packets of information for this year’s event. But same-day registration is available for those who decide that day to take the plunge. Registration begins at 10:30 a.m. Saturday. Shepley said there will be a dive team there to watch in case anyone needs help. There also will be a few fire pits available so people can stay warm. Those who are under 18 years old are required to have a legal guardian present and to sign a waiver. For more information, or to register for the event, call Shepley at (810) 300-3554. MONTAGUE, MI — Wet noses and whiskers will get a second look this weekend. Pound Buddies is teaming up with Raymond James for a “Meet & Greet” on Saturday, Aug. 23 to help both dogs and cats find new homes. The event will be held from 9 a.m. to 12:30 p.m. in the grassy park across the street from the Montague Farmers’ Market. The available animals will be made up of the dogs and cats ready for adoption from Pound Buddies Animal Shelter and Adoption Center in Muskegon. The “Meet & Greet” is being sponsored and staffed by Raymond James as part of national Raymond James Cares Month. Pound Buddies staff, volunteers and participants in Pound Buddies’ foster dog program will also be there to help and supply information as well as provide pet application forms. “This fun event will give people the opportunity to meet and play with some delightful dogs and cats and to support Pound Buddies, which does a remarkable job managing nearly 2,000 homeless dogs a year and hundreds of homeless cats,” said Judy Stojak, associate vice president for investments for Raymond James, Muskegon and Pound Buddies board member. Staff from the Raymond James office in Muskegon will be selling homemade treats for both people and pets. Additionally, a photo studio will be set up for people who would like to have their picture taken with their current pets, and live music will be provided by Montague residents, Karen and Eric Smith. Donations of dog and cat food, kitty litter and office supplies are welcome by “Meet & Greet” attendees. All goods and money raised will be given to Pound Buddies. Pound Buddies has been taking part in animal rescue in Muskegon County for more than 16 years. 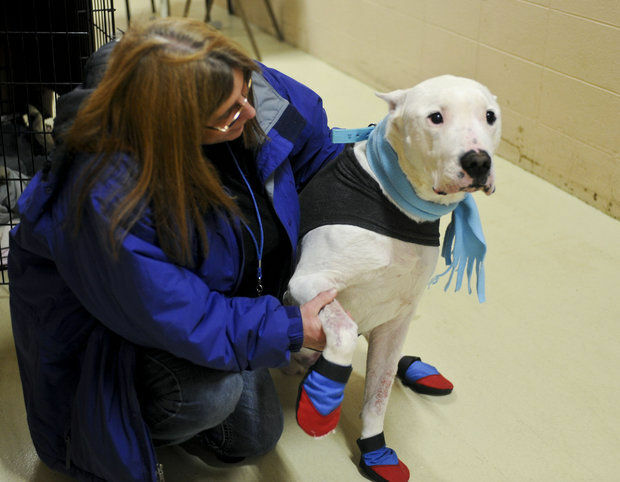 Since 2010, it has managed Muskegon County’s animal shelter where it has developed adoption and foster care programs. For those seeking information about Pound Buddies or hoping to fill out a pet application prior to the “Meet & Greet,” visit their website at www.poundbuddies.org. The Red Arrow Football Stadium will see a rise in population when the fight against cancer comes back to Lowell in full swing. With 26 teams currently signed up, Jerry Holmes anticipates more than 30 by the time Relay For Life begins at noon on Friday, June 21 to noon on Saturday, June 22. Since the first Relay For Life in Lowell, more than $325,000 has been raised for the American Cancer Society and their ongoing fight against cancer. The money collected will go to the American Cancer Society, which marks its 100th anniversary of existence. ACS was known for being one of the first organizations who fought the fight to ban smoking in restaurants and public places across the country. The teams will host a number of fundraisers around the track including games, crafts and food with the goal of raising $64,500 in mind. The family events available will include a bounce house, giant inflatable slide and a dunk tank on Friday and Saturday. There are a number of individuals who make a commitment to walk all 24 hours, and some others that walk 12 hours during the relay, Holmes elaborated. From 5 to 6 p.m. they will have a Pink Arrow “Power Hour,” with the opening ceremony and survivor celebration beginning right after. Other events during the 24-hour Relay For Life will include the opening lap, a silent auction, a Cancer Survivor Dinner, the Miss Relay Competition with a pizza party on Friday night. Saturday will pay witness to a pancake breakfast and the event’s closing ceremonies. One of the co-chairs for the Relay For Life committee is Lori Ingraham, who has helped set several goals and expectations going into this year for the cancer-fighting event. “Every pledge that we get, every dollar that we raise could be the dollar that makes the difference,” Ingraham said. One of the main nuances Ingraham has noticed over the years is the emotional and moving experience people have during the walk, who are either survivors or those who have lost loved ones to cancer.